Beasts. Monsters. Legends. We all know them, these constant companions of lore. With formidable names like Bigfoot, Loch Ness, and Dragon how could you not love each character and be drawn to their story. They reappear again and again throughout time and across cultures, as if these beings are inextricably tied to our human psyche. One creature has found a resurgence of popularity in children’s literature lately; the Unicorn, a mythic beast with an equine body and a magical horn. It is said, that during medieval times the prized horn of a Unicorn was worth more than its weight in gold. Each culture and generation adds its own unique stamp on these legendary creatures. As a result, this most recent reinterpretation of the Unicorn has a significantly more scientific lens added. It is proposed that the tusk of a Narwhal is most often the horn mentioned in medieval literature as the coveted Unicorn horn. And so, it is fitting, that children today get to enjoy the fabled life of Narwhals, in their own right, as the unicorns of the sea. And I am here to tell you, these books are fabulous. 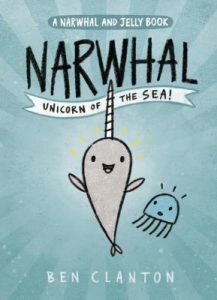 In “Narwhal: Unicorn of the Sea” by Ben Clanton we meet the ever-exuberant Narwhal who befriends the unbelieving Jellyfish. Jelly struggles to comprehend the very existence of such an odd and mythic creature as Narwhal. Narwhal on the other hand, has never heard of or seen a Jellyfish but accepts Jelly immediately. Each friend finds their worldview challenged but each take comically different routes in processing the others actuality. Coming to terms with the reality as it has presented itself, Jelly and Narwhal enjoy numerous adventures as they discover life in pods, waffles and the importance of friendship. Thankfully, Clanton continues their adventures with “Super Narwhal and Jelly Jolt”. 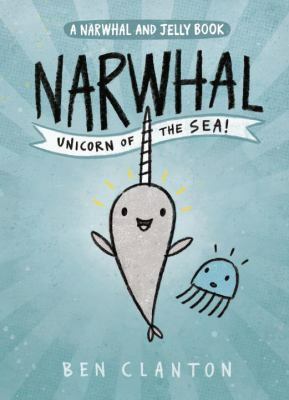 Not enough Unicorn/Narwhal literature for you? No need to worry. Bestselling author Amy Krouse Rosenthal dips her toes into the mythic Unicorn pond and brings us “Uni the Unicorn”. Rosenthal turns the Unicorn narrative on its head by supposing a Unicorn who does not believe people. And oh boy, is she in for a surprise. Lastly, but not leastly, Jessie Sima goes even further considering and creating a story where a unicorn is born underwater and raised by a pod of Narwhals in “Not Quite Narwhal”. Sima seamlessly weaves together the unicorns of lore with the modern unicorns of the sea. Must I say more, I think not.